Our roses were beautiful this year so I decided to set up my little rusty bistro table and chairs under the rose canopy. 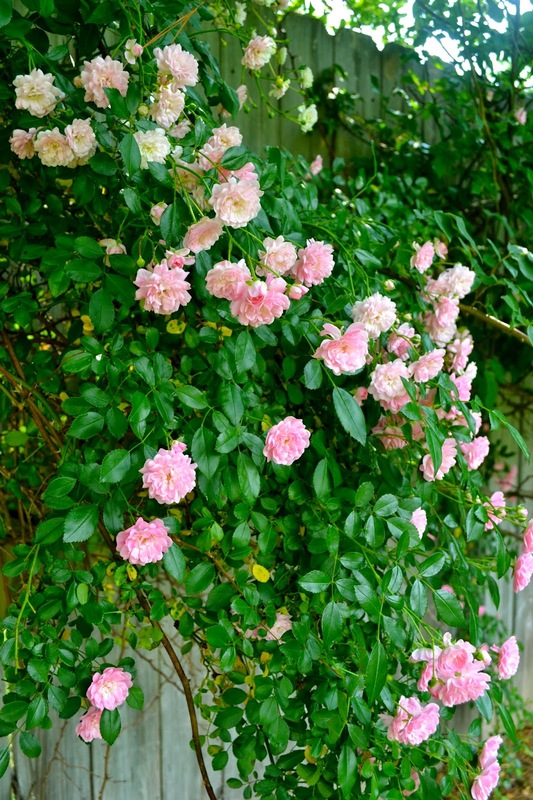 Our fence is covered with climbing roses which gives us a stunning rose show every spring. 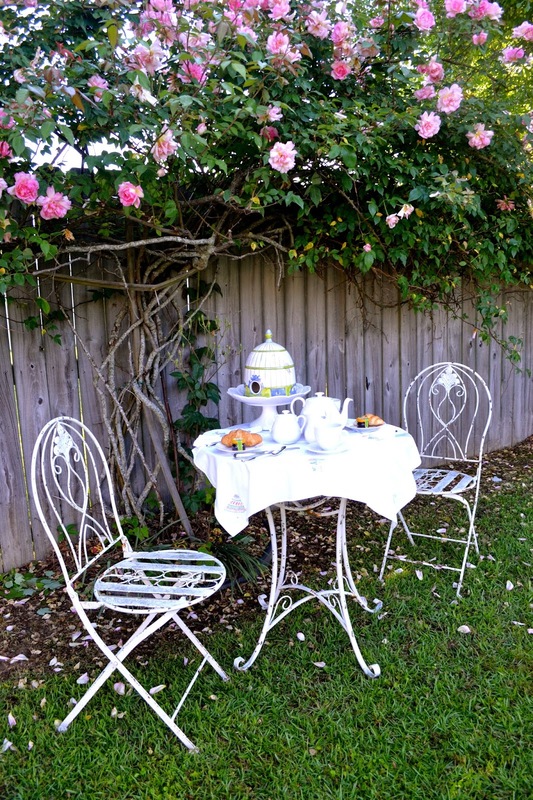 A lovely Saturday morning and blooming roses, what better reason to set-up for tea! The centerpiece is a Trompe L’Oeil Birdhouse by Molly Hatch from Anthropologie. 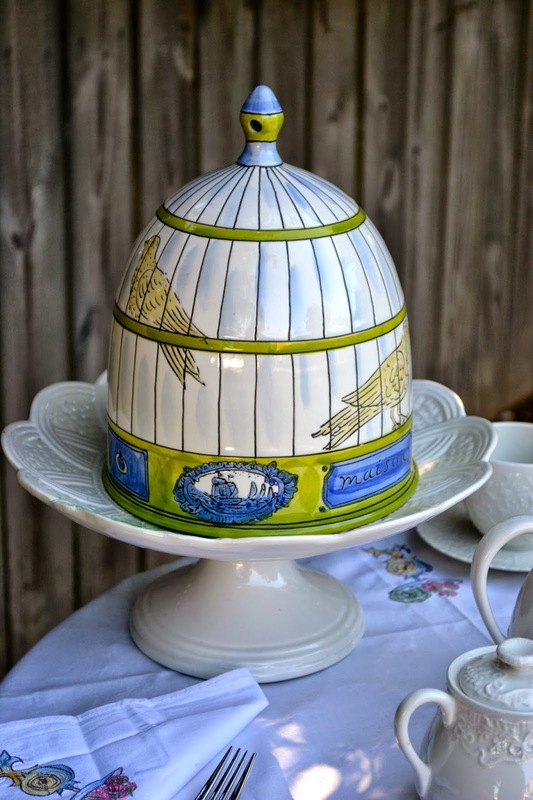 It is sitting atop a hand painted cake plate from Italy. The cake plate was given to me by my sister years ago. Still one of my favorite stands. Don’t forget to look up. 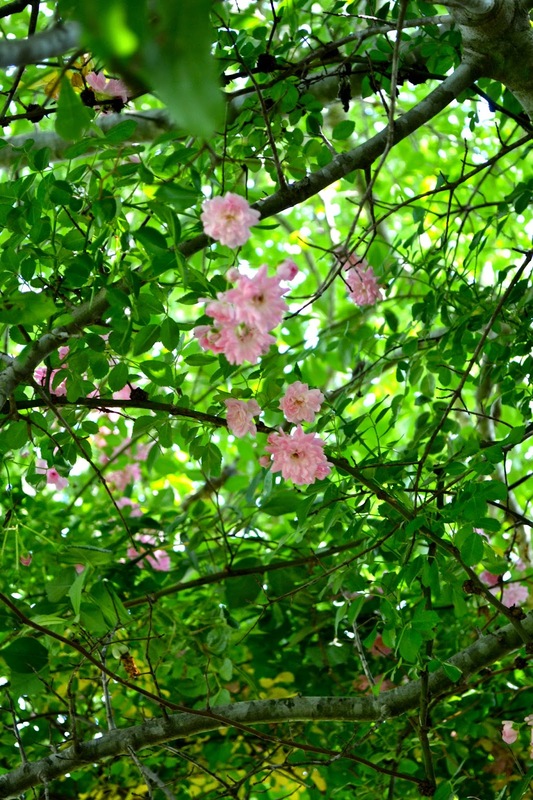 The roses have climbed into the trees so the trees look like they are blooming roses! After finishing up a little outside clean up, a table for two was the perfect spot for a break. Thanks for stopping in for a visit. As always, I enjoy and appreciate your visit. I hope you will leave a comment so I will know you stopped by. Emily, how I'd love to sit at this table and have a good visit while smelling the roses. My oh my but those roses are amazing. Makes me wish I had a spot for a climber. Had to smile when I spotted the sweet Molly Hatch bird house. I, too, have one of these. I bought this one and the other smaller one, with the thought that I would add the larger one too. Unfortunately I let the opportunity slide past me, and now they are no longer offered. Anything of Molly Hatch's work makes me smile. Love her designs. Thanks for sharing your spectacular roses and this lovely garden setting, Emily. Happy June! It is such a haven, Emily. So very, very beautiful. And I can only begin to imagine how heavenly the fragrance would be. Simply divine! What a gorgeous spot Emily, the roses are absolutely stunning! 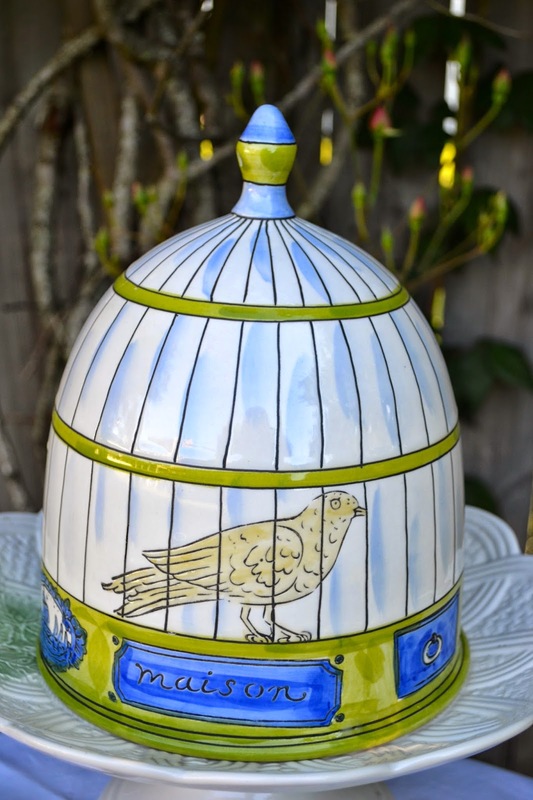 I have serious faux birdcage envy, what an adorable piece! Your table looks so inviting and the whole scene looks like a fairy tale~ it should be in that book, "Private Edens"! Any chance you can get back for the June 10th Jubilee in Fairhope? Oh my goodness, how truly LOVELY!! Found you from your comments at Rosemary and Thyme.....so glad I did - I am your newest follower now! 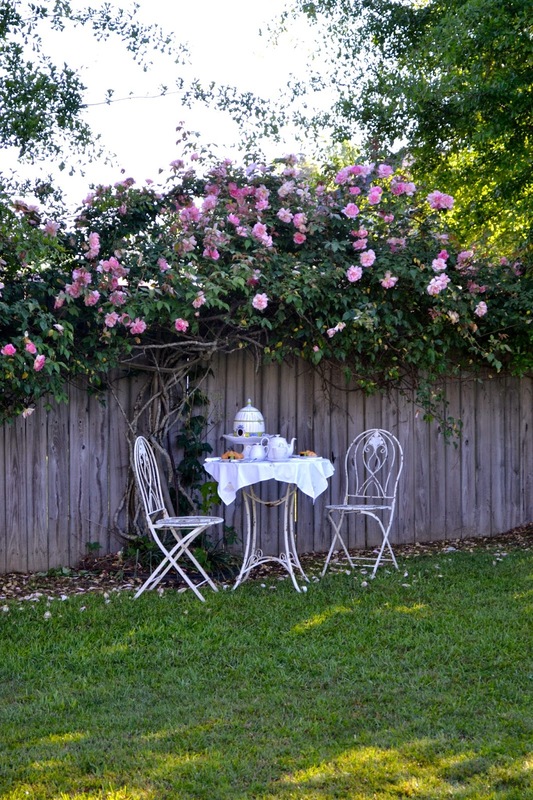 Your climbing rose setting is absolutely stunning for a spot of tea. (Pretty tea time is my ♥!) Just beautiful, Emily. Thanks for sharing something so divine. 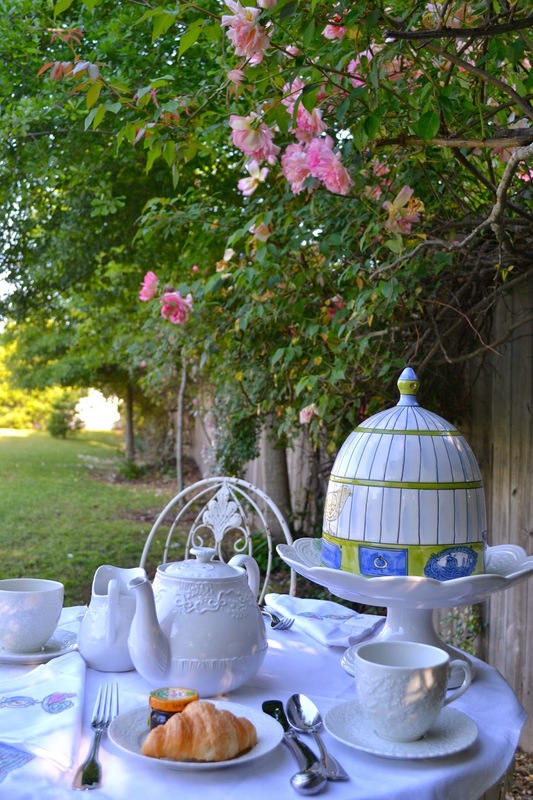 What a charming setting for your tea table! Your roses are so gorgeous and I bet their scent is heavenly. All your tea things are wonderful and I would love to join you there under that beautiful canopy of blooms. I'm so happy you could join me for tea today and have a lovely week. What a lovely setting for a tea party. Your roses are amazing. I have a few wild roses in a garden but have never been much good at growing the more traditional. I certainly enjoyed seeing yours. You chose a delightful spot under the roses for tea, and I like the birdhouse as it ties in with the beauty of nature around. I think I'd be too busy enjoying the roses to have tea! :) Beautiful spot. Anthropologie has delightful things -- so colorful and fun. Happy Tea Day! What a perfect garden setting for a contemplative tea. The roses must smell heavenly. Your bistro set is so cute and I love your china. So pretty! Une mise en scène magnifique pour ce tea party, j'adore. Tes photos sont superbes, un régal, bravo. How absolutely charming! I know it must smell as wonderful as it looks. And that croissant seems to be calling me! How lovely. Conversation here would be memorable. And the birdie adds just the right touch of extra company. Beautiful roses and tea table, Emily! I also like the little bird that stopped by to enjoy your lovely garden as well in the last photo! The roses are spectacular! I've never seen them just amble up a tree like that! So pretty! 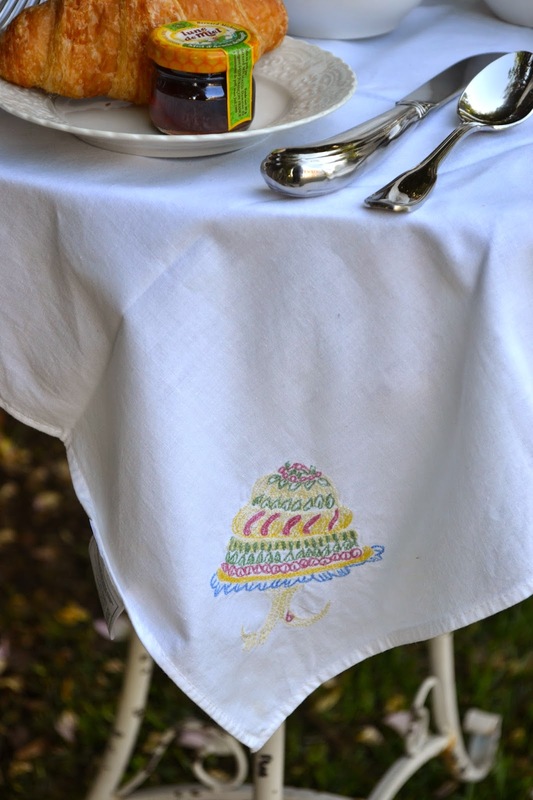 The dishes are gorgeous...the perfect thing for gathering in the garden! They work well with the Laura Ashley topper. We used to have a Laura Ashley store here in the Kansas City area. Boy, do I miss that! Beautiful, Emily! Have a wonderful, peaceful week! You have a haven of roses for tea time! I have never seen a more romantic tea setting than under your roses. Stunning! The roses are a gorgeous color too. You have set such a pretty table. Your white china is lovely. I can imagine the heavenly smell of those roses and the croissants! I love your climbing rose. It is such a magical setting for your little bistro table and tea party. 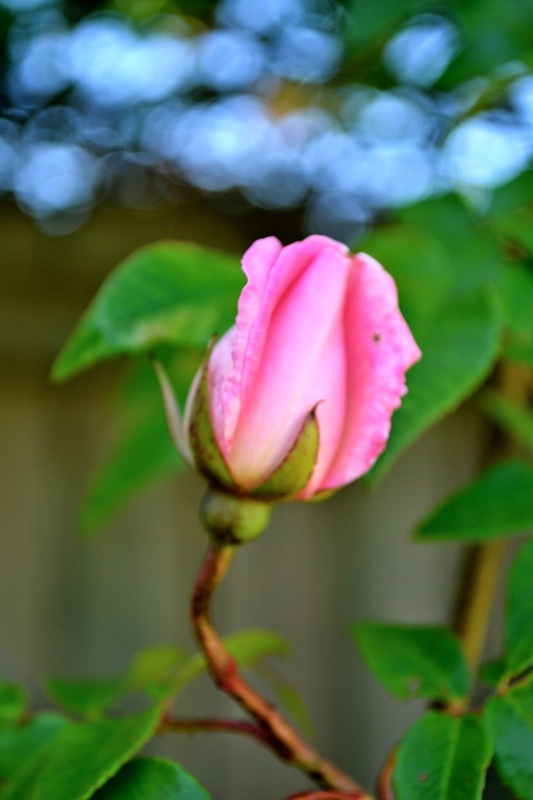 I planted several roses last summer and I hope they will be as beautiful as your rose is! These photos are amazing. Are you a photographer! I love for the outdoors garden.. I recently did a Re-Do of my Old Hutch! and placed it outside for now! Beautiful spot to have tea. Tea is the garden is so lovely. Pretty photos and thanks for sharing! This is my first time visitng your site but believe me, it wont be the last. It's so inviting and pleasant, I just wanted to linger for hours. The one photo you captures of the sunlight sneaking through your rose vines, oh, it is breathtaking. I do believe I would be taking every meal in that exact spot. What a wonderful scene you created in your garden. Love the abundance of roses. Your roses are just beautiful. I would love to be sitting at your stunning table. 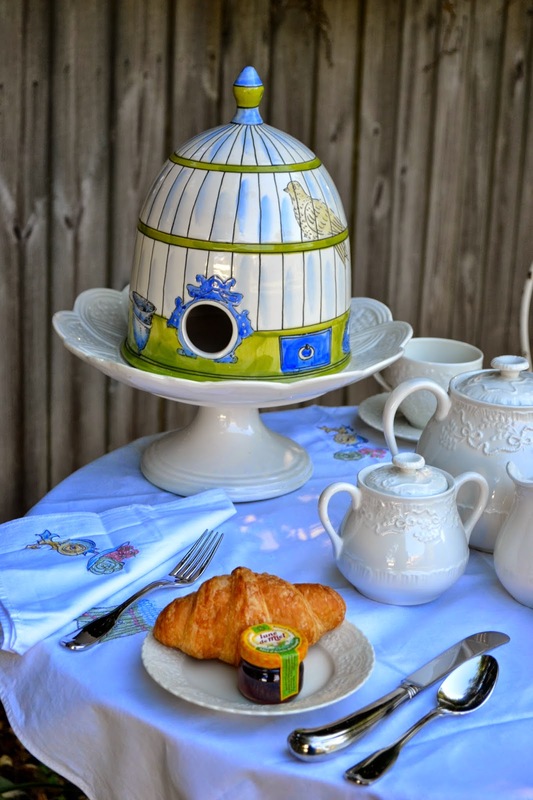 Love the birdhouse and cake stand. Emily, this is such a beautiful setting! Your roses are stunning! 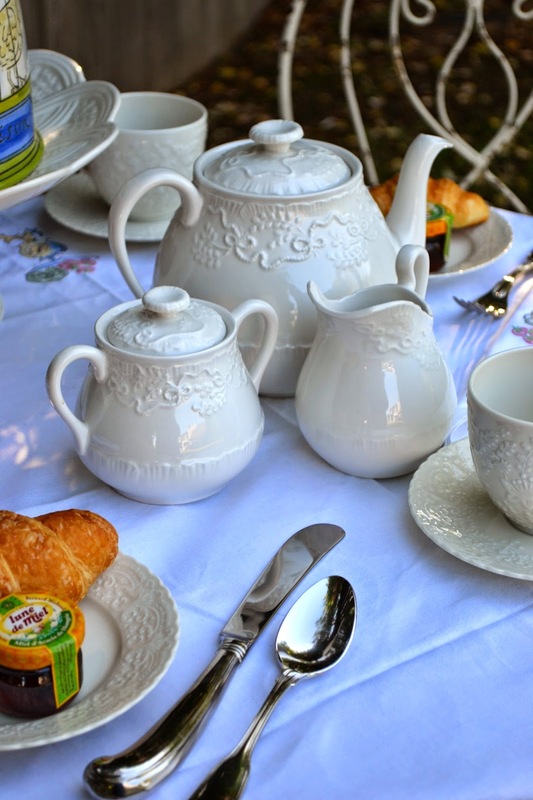 I would love to share tea with you in your gorgeous garden! I am sure the roses smell wonderful! Emily, nothing like tea in the garden. I love them climbing in the tree! Simply breathtaking! Thanks for sharing with SYC. A perfect place for tea! I love the roses! And adore the centerpiece! 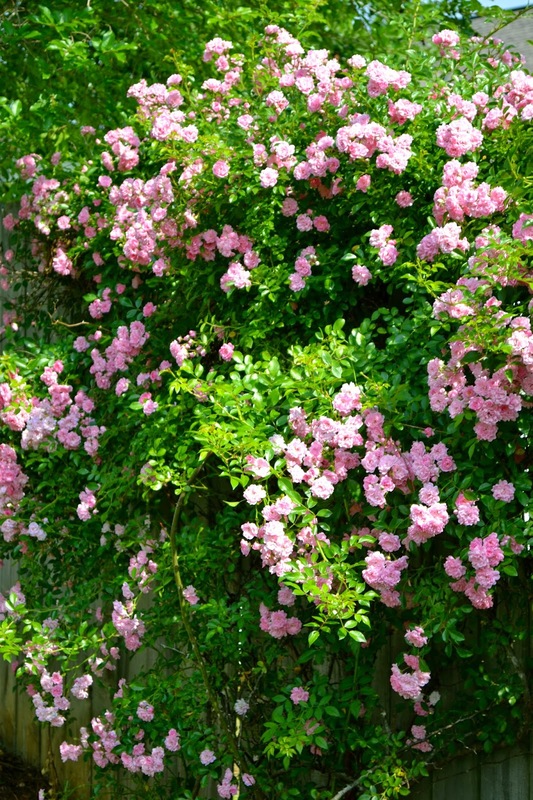 Emily, we saw so many climbing roses in Italy and I've fallen in love with them. I don't have a fence, so I'm going to have to come up with an arbor or something for them to climb on. 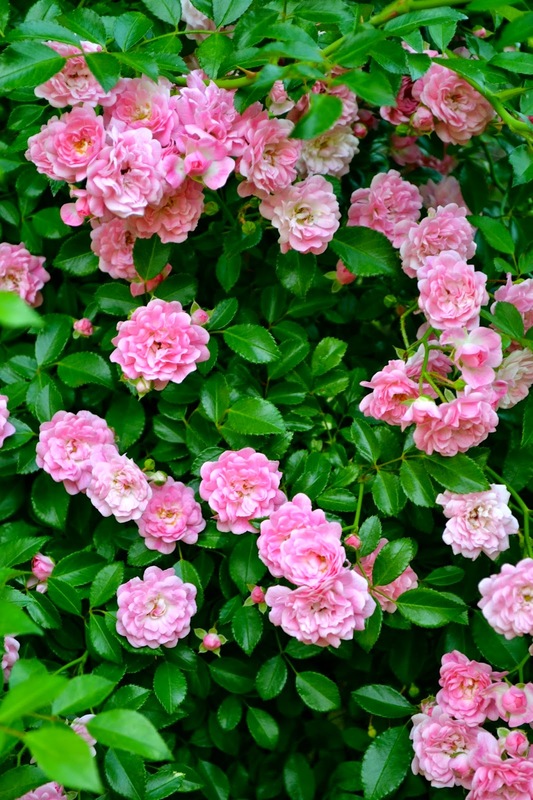 What type of rose is this and how do you maintain? I'm not a gardener, so if you know of a species that doesn't take much maintenance, please share! Oh Emily, I am crying here as I see the tender moments of summer in your yard! I LOVE THIS! I have had roses on the brain all summer long, and I've been taking photos of them in the neighborhood....I can't get enough! And here you are, sharing your own. I love how they are climbing into the tree, and your final collage, STUNNING! Tea time this summer is perfect for us since our summer is cooler than normal. Thank you for this lovely uplift! And yes, you are IN for the EUROPE PARTY! I will add your name and link now; keep close watch for another reminder post from me. We go "live" on July 18 and keep your post up until July 25. Enjoy!!!!!!! 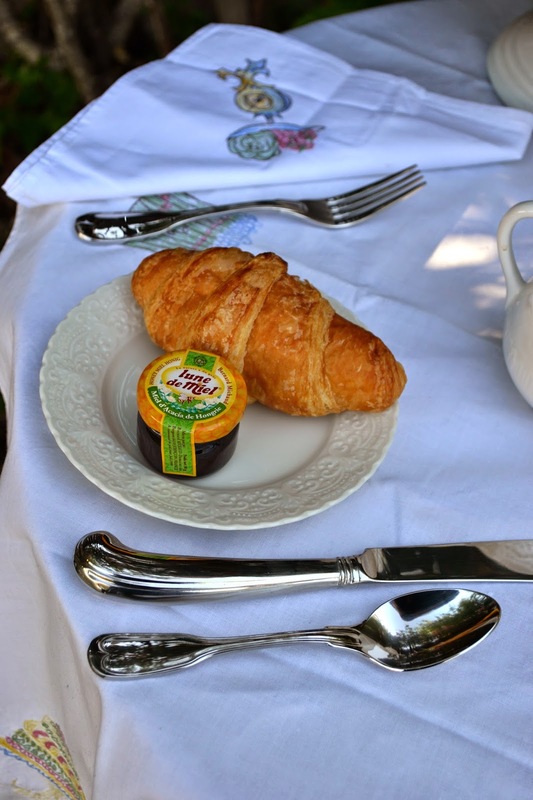 Emily, I want to sit with you under the roses at your delightful tea table and eat croissants and sip tea! What a lovely table in a pretty setting. Oh this is lovely Emily. It is exactly where I would love to be right now. 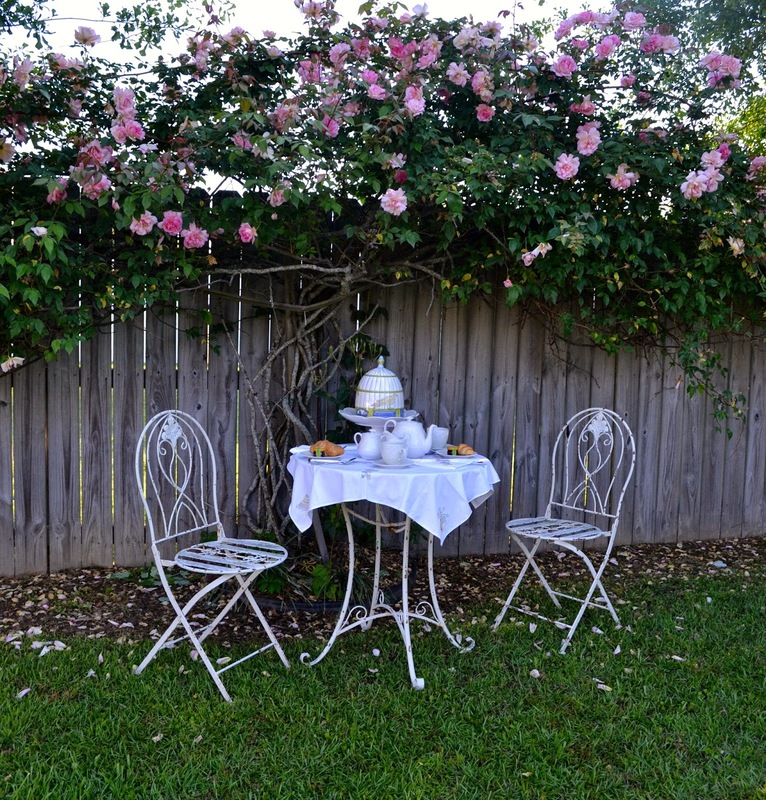 You have created a sweet and romantic spot to enjoy a sweet treat under those stunning roses. I am in love with the delicate Ralph Lauren tea set. Beautifully done. I hope you can stop by for a visit. Emily, I love Anthropologie and RL :) Your tea time for two is perfect for summer or ANY time. Your garden is exquisite.. and the roses are lovely. I hope you are enjoying your summer! We are building a home and I'm a little out-of-sorts with all of the construction. My blogging is taking a back seat so if I miss anything ~ stop by and I'll make sure to pop over! !